Transporting you from Sicilia to Bohemia and safely home once more, Shakespeare's The Winter's Tale is a spellbinding tale of jealousy, prophecy and redemption that celebrates the magic of story-telling and the power of forgiveness. Lose yourself in this fantastical play filled with love and loss at Folger Theatre in D.C.
"...Posner is trying something different, it seems, with his latest Shakespeare production for the Folger, “The Winter’s Tale,” and what that constitutes is hard to put one’s finger on — and harder to like. Directorial conceits are applied delicately, in keeping with the gentler threads of this Shakespearean romance, balanced on the precarious edge of comedy and tragedy. But there’s a deficit of energy, imaginative and otherwise, on the stage on this occasion, the result being that the little statements articulated here never develop the kind of momentum that would form a bigger one." "...The Folger works its alchemy again with The Winter’s Tale, Shakespeare’s weird and wonderful yarn of a jealous king who gets his comeuppance, but also his redemption. It’s a clever, fun, and emotionally intimate production, and, as is so often the case with the best of Folger, the vibe feels as if a tight-knit troupe of travelling players pitched up on a winter’s eve to offer a well-loved entertainment. There is humor, pathos, and a charming musical score — all delivered with a metaphorical twinkle in the eye." "...I myself have long classified the play a tragedy with a semi-sweet ending, that is until I attended the Folger Theatre's beautiful production. Director Aaron Posner's The Winter's Tale is remarkable because it leads us to think that the play has been misunderstood. Rather than simply characterized as a comedy or tragedy, this Winter's Tale is a poignant story about forgiveness, the passage of time, and folly of old men." "...Director Aaron Posner has brought a beautiful and magical production of The Winter's Tale to the Folger Theatre in Washington. The play shimmers, from the multi-talented 12-member cast to the live music composed by cast member Liz Filios and performed by the actors." "...The Winter’s Tale is a roller coaster in all senses of the term: Highs and lows, joy and sorrow, and anger and regret. Folger Theatre presents the play as a magical tale, using the nature of storytelling to allow the audience to accept and welcome the absurdities and extremes of the play." 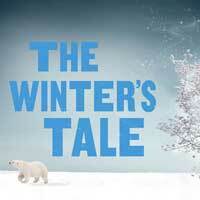 "...“The Winter’s Tale” is not as well-known as Shakespeare’s other works but it has all the heart and wit of the Bard. It also has some of the most surreal bits of stage business that put it more in line with a Greek Tragedy or a Grimm’s fairy tale. Puppets, music, suspense, and laughter abound in a play that warms the spirit against the bitter cold of long winter’s night. In a word: Magical." "...Folger had the good timing to stage A Winter’s Tale in the throes of an unseasonably cold spring, and Mother Nature it seems has worked in the company’s favor here: this show is just the thing to help the audience curl up and get cozy — as long as they can let go and embrace the zaniness of this particular classic."